still unknown although oxidation of cells causes debris to be deposited over time causing cell death. This slowly causes loss of central vision (starting with distortion in vision then leading to loss of central vision). Early changes in the macula can be detected by dilated retinal examination. Our eye doctors can detect these early signs (called drusen) in your retina. Our eye doctors may give you an Amsler Grid test to take home and monitor your vision for any distortion in central vision. 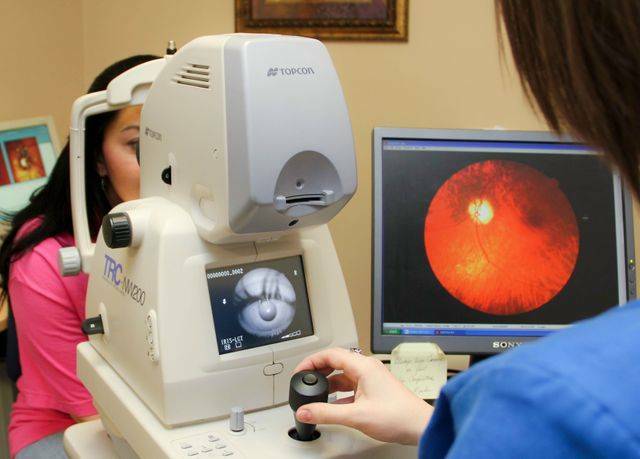 Our eye doctors may order a retinal photograph of your macula for comparison to monitor minute changes over time. This is simply a digital photograph of the back of your eyes. If visual detection is difficult and you are symptomatic, our eye doctors will refer you to an appropriate retinal specialist for more advanced testing (specifically, a dye test to detect leakages from the blood vessels). Currently, there are no cure for dry macular degeneration. However, recent studies revealed that certain compounds (vitamins A, C, E, zinc, copper) have been shown to slow down the progression by 33%. These compounds are found in commercially available formulations (ICAPS – AREDS, Ocuvite Preservision, TEBS). Our eye doctors routinely recommend these compounds for those with dry macular degeneration. Currently, there are some treatment options aimed at halting the bleeding associated with wet macular degeneration. These include injections of medications (avastin) into your eye to halt the bleeding. However, once bleeding has started in wet macular degeneration, recovery of vision is slim. Our eye doctors can detect some instances of bleeding from macular degeneration and can refer you to the appropriate retinal specialists for these injections. To learn more about the disease macular degeneration, check out our educational videos.